Moving on to section #5 of the video series, Optimizing Ad Performance, we start to see the light at the end of the tunnel of this video series! Stay tuned for parts 6 & 7 to close out this marathon of AdExcellence. The bottom line of this video is really is how to spend more with MSN and the answer is: increase everything as it pertains to optimization. The video starts out by defining optimization as it pertains to PPC, encourages you to run performance reports and gives sample scenarios of issues and possible solutions. Just something to note as a direct quote from the video: “Her CTR may be too low for her ads to be displayed.” Meaning that unless people are clicking your ad, your ad could get dinged- even though the base issue to begin with is that there are a low number of impressions to show for. Users are encouraged to use the Keyword Research and Mutation tools to expand keyword lists. And last, but not least- an underutilized budget. Suggestions being to increase the bid, increase the number of keywords and apply targeted bidding. Using the keyword bid estimator for bid estimates, keyword tool to add keywords and targeted bidding to increase exposure to more searchers. MSN recommends when testing your ads, you need to have at least 3 ads per ad group running. They also recommend that you allow 3 weeks to allow the ad group to gather enough data before changing anything or 1,000 impressions, whichever comes first. Ad testing tactics should address your audience, business type, product or service and your specific needs. Delete poor performing ads (don’t forget to check your ad position first) so that the best performing ads get more impressions. Same goes for bids and ad relevance when determining which ad to delete. Set up “Succeeding Tests” -where the top performing ad becomes the control and new ad copy is created based on the control with 1 variable. Know that you should always delete under performing ads and create new ads, rather than editing a poor performing ads. The poorer ad retains the previous ad’s performance history. Have at least 2 ads in each ad group- preferably one static and one dynamic. 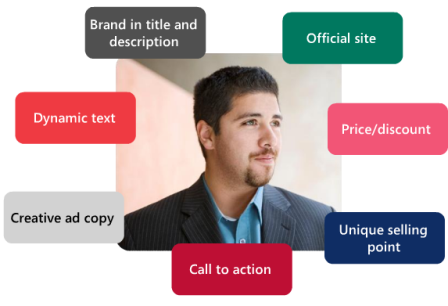 Identify the key elements of ad copy- editorial style, dynamic text, unique selling proposition, branding and calls to action. There is then a rehash of the editorial guidelines in regards to correct spelling, grammar, language, superlatives and using of common abbreviations and punctuation. Know the difference and benefits between keyword insertion vs. parameter insertion. Keyword insertion, inserts the exact keyword into the ad, makes the ad relevant and is easy and immediate. Parameter insertion, customizes the keyword for proper grammar, capitalization, spelling, keeps the ad in character limits and can use different values. Know the ad limits, 25 characters for title, 70 for the body and to provide default text for dynamic text. From here, they go into customer profiling, knowing what your customer demographics are, the service/product attributes, brand and the call to action that will attract them. In particular, they mention income, age, gender, location and lifestyle behavior- some of which is tied into demographic and geographic reporting in the research tab and point you to researching your customers through 3rd party market research like industry research reports. MSN also covers seasonality for ad copy, but what it more interesting it the recommendation to create a “mirror” ad group for seasonality and instead of pausing non-seasonal ads in an ad group and adding new ones for the duration of the holiday, a totally new ad group with the same keywords, seasonal ad copy and pausing the non-seasonal ad group. And of course, the inclusion of keywords in the ad copy- particularly mentioning “search query repetition” where the keyword appears in the ad title and body copy. This is a bit of a refresher from before, what is dynamic text, where it appears, why you’d use it and character limits. And then they bring up again, the 38% increase in CTR when it’s in the ad vs. when it’s not. Ad Position- this section seems very out of place in this specific video. It outlines that the ad position factors are bid, quality and CTR performance to decide if your ad goes in the mainline or right rail and in which position. Best practices for improving your ad rank: increase your CPC amount, improve ad copy (with keywords), landing page and match type. The rest of the video is a rehash of products/features already covered but now in the context where MSN asks that your account or ads not be a giant mess and ruin Bing search results. Skip it. Ready for MSN AdExcellence tutorial #6? Missed MSN AdExcellence tutorial #4?